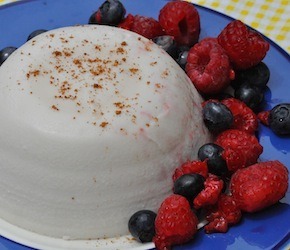 Traditionally this Italian pudding is made with milk and cream. Coconut milk offers a dairy free alternative that is just as rich and satisfying. This simple and elegant dessert is perfect for a hot summer evening and pairs beautifully with seasonal fruits. Gelatin offers many wonderful health benefits. Read about them here. Dissolve gelatin in room temperature water and set aside. In a saucepan heat coconut milk until hot but not boiling. Pour hot milk into gelatin and stir to dissolve. Pour into a bowl and allow to set in fridge. When ready to serve place bowl in hot water for a few seconds and then flip onto a plate. Serve with a sprinkle of nutmeg and fresh berries or rhubarb compote.